Shaun Tuton believes he would be ready if a move to the Football League materialises - but remains focused on firing Halifax out of the relegation zone. The Town striker has been linked with a move to Championship clubs Cardiff and Birmingham after a spectacular scoring run of seven goals in three games last month. 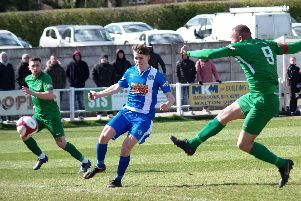 The forward, who produced another dazzling display in the midweek thrashing of Tamworth in the FA Trophy, isn’t fazed at the prospect of playing in the second tier, but insists his main priority is helping his current club move up the National League table. “I think I’d be ready for it,” he said. “I’d be training with them and I wouldn’t be getting chucked straight in the deep end, I’d be able to get used to the players, a bit like I had to do here. “I came up a couple of leagues to come here so you’re playing with better players, and that would be the case if I moved up again. Tuton was made aware of the speculation surrounding his future by friends who saw his name linked to a move in the national press. “I didn’t see it straight away - my friends were sending me pictures,” he said. “Obviously they’re Championship sides so it’s a massive boost in confidence for me. “All the lads have been asking me about it but like I’ve said to them, at this moment in time I’ve got to keep my head down at Halifax, keep playing how I’m playing and hopefully if everything did go right, I might get a move. “I’ve had a few different clubs that people have been telling me might be interested but I’ve got to let it go in one ear and out of the other for the moment. Tuton has been likened to former Town striker Jamie Vardy and is flattered by such comparisons. “I’ve watched Vardy and he’s a class player. He’s been on fire this season,” said Tuton. “That’s helped me because he played here and people have said to me that I’m exactly the same player as him, with the pace I’ve got. “But getting mentioned alongside him at this level is great. “Obviously I’d be buzzing if I could get higher - that’s always been my aim. Tuton scored just once in Town’s first 22 games this season, having joined the club following an impressive spell on trial in pre-season. However, he is now an integral part of the side under Jim Harvey, and insists he was confident he could become a first-team regular at The Shay. He said: “I’ve been playing well. I’ve been a bit more on the left helping out the team, but if I’m put back up front I’ll keep on scoring. “I’ve always said if I play up front I will always score goals for a club. “Without sounding big-headed, I knew that once I got settled in, if I did get signed, I knew I’d become involved in the team once people saw my ability. Tuton says some soul searching among the Town squad has helped their recent upturn in results, and that Harvey has fostered a good spirit in the camp. He added: “Since we won the first game and gone on an unbeaten run the atmosphere in the changing room and at training is a lot better. “He’s got the boys a bit more together but I think the main thing is that when we’ve been sat together in the changing room or our card schools, we’ve said we’ve got to sort ourselves out or we’re going to get relegated.